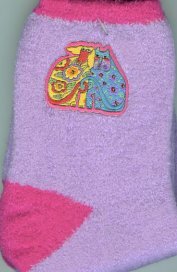 Here are a pair of very soft slipper socks featuring Laurel Burch's Kindred Spirit design. 89% nylon, 10% polyester and 1% spandex, these socks fit women's size size 9-11. We were impressed at how soft they are - perfect for people who's feet are cold at night.